Here is the source code of the awesome cars demo site I presented at the Sitecore User Group (Cardiff) on 24/11/2014. This site illustrates how to use Sitecore and Solr to implement content search, computed fields, facets and auto complete using Solr NGrams. Click here to download the source code. This includes the Visual Studio Project and the Custom Solr Schema file. Click here to download the Sitecore content package. 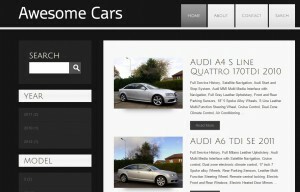 Build the Awesome Cars visual studio solution and publish it to your Sitecore folder. Login to Sitecore and publish the whole website. Previous Post Sitecore 7 & Solr – Why SearchResultItem.Url is always null?